Ted was a valuable and versatile member of SLOC. Ted was dedicated to SLOC. He showed his love for SLOC, by not only in performing or directorial capacities, but also back stage as a Chairman of Makeup and Board member. In an era where many wish to be only in the spotlight, Ted knew that in order for a theater company to succeed, all facets of the company must be running smoothly and efficiently, from principle performers to the people who build the sets to the ushers to the concession workers. Ted understood this. In the show, Anne of Green GablesTed played the role of (Mathew Cuthbert) Anne’s father. And it was fitting that as a dedicated family man he was able to work along side his son Greg (lighting) and his daughter-law Suzane Talarico (Rachel Lynde). Such occasions meant a lot to Ted. Ted also worked along side Greg and Suzane, when he directed Into the Woods. By coincidence SLOC is producing Into the Woodsthis season. That’s fitting and proper. This year SLOC celebrates its 90th birthday. A company made up entirely of volunteers. Mr. Ted Rucinski exemplifies the spirit of volunteerism, an example for all of us to follow. It was a privilege to know Ted. Rest in peace my friend! 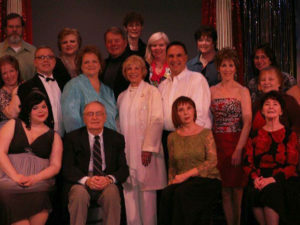 This is the Follies cast & crew reunion shot taken in 2010, after the final matinee production of Side-by-Side by Sondheim. Ted is in the front row. It was 10 years after Follies. 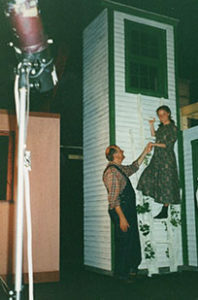 Ted with Carrie Bee in Anne of Green Gable, 1993.